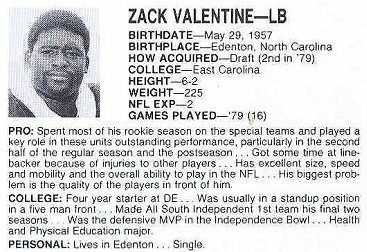 As the Pittsburgh Steelers’ second pick of the 1979 season, Zack Valentine wasn’t even sure what he was getting into. It would seem near impossible for a defensive player the caliber of Valentine to be unaware of the greatness that was the Steeler’s defense, but for the young Pirate, his NFL focus didn’t stretch much beyond Washington and the Redskins, or Houston, where his favorite player, Earl Campbell, played. But Valentine learned quickly that he was now a bona fide member of the vaunted Steel Curtain defense. 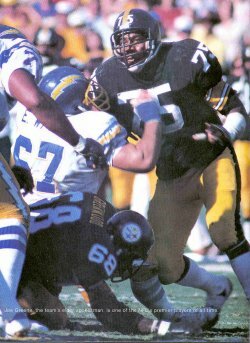 With Mean Joe Greene, Ernie Holmes, and Dwight White in the trenches; Ham, Lambert, and Andy Russell at linebacker; and Mel Blount, J.T. Thomas, Mike Wagner, and Glen Edwards in the back, the Steelers’ defensive platoon during the 1970s was arguably one of the best-ever assembled. At the time, East Carolina was a relatively small blip on the radar of the landscape of college football, and after Valentine’s comment, Lambert said as much in an interview that Valentine had to endure reading the night before his first day in training camp. But the Steelers – those Steelers – and that Steel Curtain, were woven of small school stars. 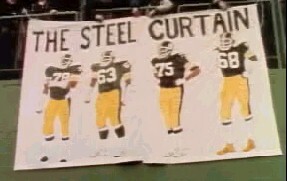 Other than Penn Stater Ham, the big players of the Steel Curtain were from no-name schools – Mean Joe from North Texas State, Blount from Southern, Wagner from Western Illinois, Lambert from Kent State, Holmes from Texas Southern, Edwards from Florida A&M, White from East Texas State, and Toews from California. Despite his faux paux, Valentine quickly became a part of the fabric in Pittsburgh. It didn’t take long for Valentine to be taken under the wing of a wily vet. In his case, it was Mean Joe, who was anything but mean. Greene wasted little time trying to instill in Valentine what it meant to be a champion in the ultimate of leagues. Of course, history bears out that Greene was right, as it took Valentine just a single season to collect his Super Bowl ring, earned in a 31-19 win over the Rams in Super Bowl XIV in Pasadena, CA. Though Valentine was mostly a special teams player his rookie year, he did factor in with a fourth quarter tackle of Eric Hill on a kick return. Being around so many talented players was a bonus to him as a player. But even more than that, he was around some great people, most of whom had anything but normal personas. “There were some characters on that team,” Valentine said. Not the least of which was Terry Bradshaw. “I gotta tell you a story about Bradshaw and Bleier,” he said. “Both of them wear toupees. And they wouldn’t dare go to a speaking engagement without their hair. Well, one day, Bradshaw had a speaking engagement and had forgotten his toupee. Bradshaw left practice early and grabbed Bleier’s toupee. Valentine assures that Bradshaw was then and is now the very same guy you see on NFL Sunday on Fox and on those telephone commercials. And speaking of commercials, Valentine said that Greene truly was the man in the legendary Coca-Cola commercial where he tosses his jersey to the kid in the tunnel. “That commercial is Joe Greene,” he said. “When he filmed that commercial, he was so upset when he came back because at the end, when they were filming, he had accidentally burped. He wanted to do it over because it was a serious thing to him. He was the type to give his hardest no matter what he was doing. Valentine’s awe of Greene was certainly justified. Valentine also had a great deal of love and respect for Greenwood. Valentine is very proud of his stop in Pittsburgh, the memories of which overshadow a convoluted trade, botched by Baltimore, that eventually landed him with the Philadelphia Eagles. It seems, to Valentine, that it was just yesterday that he was preparing for the Super Bowl. 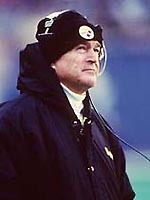 But even in his excited state of mind, he and his roommate already knew and embodied the attitude of champions, as Chuck Noll inspired in all of his players. “The thing in Pittsburgh was that when we went on the field, it was all about getting the job done and going home afterward,” he said. “Even in the Super Bowl. These guys… Coach Noll, his staff, the players… we were all used to winning. Everyone knew how to win, how to intimidate. We all knew how great this team was. Yes, Valentine has been behind the Steel Curtain and will forever be linked to a decade of greatness in the National Football League. And through him, all Pirate fans are connected to that great moment in football. There was a Pirate among them.